GREEN EXPLOSION by Top Crop is an excellent stimulator for the vegetative stage, specifically formulated with plant extracts, based mainly on seaweeds and leguminous pollen, increadibly rich in natural steroids. 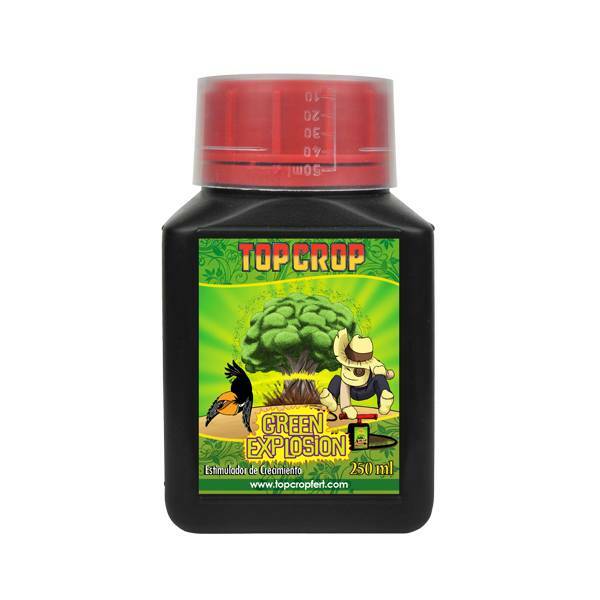 This Grow booster by Top Crop promotes cell proliferation and helps the plants to increase in the volume and root system. Top Crop Big Explosion also increases the level of chlorophyll content for a better photosynthesis process. Considerably bigger shoots (up to 30%) is the perfect starter for your indoor growing to reach then amazing results during the blooming phase. Moreover, this product it is an excellent revitalizer and helps the recovery from damages often caused by pests and different stress factors (drought, high temperatures, etc ..). Application by foliar spraying and irrigation: Apply every three weeks during the growing stage of the plant. Store in a cool, dry place. Avoid high temperatures.